FLASHBACK: Alex Jones’ June 24, 2008 interview with Dr. Paul Kossey, H.A.A.R.P. Program Manager for Air Force Research Laboratory Space Vehicles Directorate (operating out of Hanscom Air Force Base in Massachusetts). This invention relates to a method and apparatus for altering at least one selected region normally existing above the earth’s surface and more particularly relates to a method and apparatus for altering said at least one region by initially transmitting electromagnetic radiation from the earth’s surface essentially parallel to and along naturally-occurring, divergent magnetic field lines which extend from the earth’s surface through the region or regions to be altered. In the late 1950′s, it was discovered that naturally-occuring belts exist at high altitudes above the earth’s surface, and it is now established that these belts result from charged electrons and ions becoming trapped along the magnetic lines of force (field lines) of the earth’s essentially dipole magnetic field. The trapped electrons and ions are confined along the field lines between two magnetic mirrors which exist at spaced apart points along those field lines. The trapped electrons and ions move in helical paths around their particular field lines and “bounce” back and forth between the magnetic mirrors. These trapped electrons and ions can oscillate along the field lines for long periods of time. In the past several years, substantial effort has been made to understand and explain the phenomena involved in belts of trapped electrons and ions, and to explore possible ways to control and use these phenomena for beneficial purposes. For example, in the late 1950′s and early 1960′s both the United States and U.S.S.R. detonated a series of nuclear devices of various yields to generate large numbers of charged particles at various altitudes, e.g., 200 kilometers (km) or greater. This was done in order to establish and study artifical belts of trapped electrons and ions. These experiments established that at least some of the extraneous electrons and ions from the detonated devices did become trapped along field lines in the earth’s magnetosphere to form artificial belts which were stable for prolonged periods of time. For a discussion of these experiments see “The Radiation Belt and Magnetosphere”, W. N. Hess, Blaisdell Publishing Co., 1968, pps. 155 et sec. Other proposals which have been advanced for altering existing belts of trapped electrons and ions and/or establishing similar artificial belts include injecting charged particles from a satellite carrying a payload of radioactive beta-decay material or alpha emitters; and injecting charged particles from a satellite-borne electron accelerator. Still another approach is described in U.S. Pat. No. 4,042,196 wherein a low energy ionized gas, e.g., hydrogen, is released from a synchronous orbiting satellite near the apex of a radiation belt which is naturally-occurring in the earth’s magnetosphere to produce a substantial increase in energetic particle precipitation and, under certain conditions, produce a limit in the number of particles that can be stably trapped. This precipitation effect arises from an enhancement of the whistler-mode and ion-cyclotron mode interactions that result from the ionized gas or “cold plasma” injection. The present invention provides a method and apparatus for altering at least one selected region which normally exists above the earth’s surface. The region is excited by electron cyclotron resonance heating of electrons which are already present and/or artifically created in the region to thereby increase the charged particle energy and ultimately the density of the region. In one embodiment this is done by transmitting circularly polarized electromagnetic radiation from the earth’s surface at or near the location where a naturally-occurring dipole magnetic field (force) line intersects the earth’s surface. Right hand circular polarization is used in the northern hemisphere and left hand circular polarization is used in the southern hemisphere. The radiation is deliberately transmitted at the outset in a direction substantially parallel to and along a field line which extends upwardly through the region to be altered. The radiation is transmitted at a frequency which is based on the gyrofrequency of the charged particles and which, when applied to the at least one region, excites electron cyclotron resonance within the region or regions to heat and accelerate the charged particles in their respective helical paths around and along the field line. Sufficient energy is employed to cause ionization of neutral particles (molecules of oxygen, nitrogen and the like, particulates, etc.) which then become a part of the region thereby increasing the charged particle density of the region. This effect can further be enhanced by providing artificial particles, e.g., electrons, ions, etc., directly into the region to be affected from a rocket, satellite, or the like to supplement the particles in the naturally-occurring plasma. These artificial particles are also ionized by the transmitted electromagnetic radiation thereby increasing charged particle density of the resulting plasma in the region. In another embodiment of the invention, electron cyclotron resonance heating is carried out in the selected region or regions at sufficient power levels to allow a plasma present in the region to generate a mirror force which forces the charged electrons of the altered plasma upward along the force line to an altitude which is higher than the original altitude. In this case the relevant mirror points are at the base of the altered region or regions. The charged electrons drag ions with them as well as other particles that may be present. Sufficient power, e.g., 10 15 joules, can be applied so that the altered plasma can be trapped on the field line between mirror points and will oscillate in space for prolonged periods of time. By this embodiment, a plume of altered plasma can be established at selected locations for communication modification or other purposes. The earth’s magnetic field is somewhat analogous to a dipole bar magnet. As such, the earth’s magnetic field contains numerous divergent field or force lines, each line intersecting the earth’s surface at points on opposite sides of the Equator. The field lines which intersect the earth’s surface near the poles have apexes which lie at the furthest points in the earth’s magnetosphere while those closest to the Equator have apexes which reach only the lower portion of the magnetosphere. At various altitudes above the earth’s surface, e.g., in both the ionosphere and the magnetosphere, plasma is naturally present along these field lines. This plasma consists of equal numbers of positively and negatively charged particles (i.e., electrons and ions) which are guided by the field line. It is well established that a charged particle in a magnetic field gyrates about field lines, the center of gyration at any instance being called the “guiding center” of the particle. As the gyrating particle moves along a field line in a uniform field, it will follow a helical path about its guiding center, hence linear motion, and will remain on the field line. Electrons and ions both follow helical paths around a field line but rotate in opposite directions. The frequencies at which the electrons and ions rotate about the field line are called gyromagnetic frequencies or cyclotron frequencies because they are identical with the expression for the angular frequencies of gyration of particles in a cyclotron. The cyclotron frequency of ions in a given magnetic field is less than that of electrons, in inverse proportion to their masses. The generation of electricity by motion of a conducting fluid through a magnetic field, i.e., magnetohydrodynamics (MHD), provides a method of electric power generation without moving mechanical parts and when the conducting fluid is a plasma formed by combustion of a fuel such as natural gas, an idealized combination of apparatus is realized since the very clean-burning natural gas forms the conducting plasma in an efficient manner and the thus formed plasma, when passed through a magnetic field, generates electricity in a very efficient manner. Thus, the use of fuel source 42 to generate a plasma by combustion thereof for the generation of electricity essentially at the site of occurrence of the fuel source is unique and ideal when high power levels are required and desirable field lines 11 intersect the earth’s surface 40 at or near the site of fuel source 42. A particular advantage for MHD generators is that they can be made to generate large amounts of power with a small volume, light weight device. For example, a 1000 megawatt MHD generator can be construed using superconducting magnets to weigh roughly 42,000 pounds and can be readily air lifted. This invention has a phenomenal variety of possible ramifications and potential future developments. As alluded to earlier, missile or aircraft destruction, deflection, or confusion could result, particularly when relativistic particles are employed. Also, large regions of the atmosphere could be lifted to an unexpectedly high altitude so that missiles encounter unexpected and unplanned drag forces with resultant destruction or deflection of same. Weather modification is possible by, for example, altering upper atmosphere wind patterns or altering solar absorption patterns by constructing one or more plumes of atmospheric particles which will act as a lens or focusing device. Also as alluded to earlier, molecular modifications of the atmosphere can take place so that positive environmental effects can be achieved. Besides actually changing the molecular composition of an atmospheric region, a particular molecule or molecules can be chosen for increased presence. For example, ozone, nitrogen, etc. concentrations in the atmosphere could be artificially increased. Similarly, environmental enhancement could be achieved by causing the breakup of various chemical entities such as carbon dioxide, carbon monoxide, nitrous oxides, and the like. Transportation of entities can also be realized when advantage is taken of the drag effects caused by regions of the atmosphere moving up along diverging field lines. Small micron sized particles can be then transported, and, under certain circumstances and with the availability of sufficient energy, larger particles or objects could be similarly affected. Particles with desired characteristics such as tackiness, reflectivity, absorptivity, etc., can be transported for specific purposes or effects. For example, a plume of tacky particles could be established to increase the drag on a missile or satellite passing therethrough. Even plumes of plasma having substantially less charged particle density than described above will produce drag effects on missiles which will affect a lightweight (dummy) missile in a manner substantially different than a heavy (live) missile and this affect can be used to distinguish between the two types of missiles. A moving plume could also serve as a means for supplying a space station or for focusing vast amount of sunlight on selected portions of the earth. Surveys of global scope could also be realized because the earth’s natural magnetic field could be significantly altered in a controlled manner by plasma beta effects resulting in, for example, improved magnetotelluric surveys. Electromagnetic pulse defenses are also possible. The earth’s magnetic field could be decreased or disrupted at appropriate altitudes to modify or eliminate the magnetic field in high Compton electron generation (e.g., from high altitude nuclear bursts) regions. High intensity, well controlled electrical fields can be provided in selected locations for various purposes. For example, the plasma sheath surrounding a missile or satellite could be used as a trigger for activating such a high intensity field to destroy the missile or satellite. Further, irregularities can be created in the ionosphere which will interfere with the normal operation of various types of radar, e.g., synthetic aperture radar. The present invention can also be used to create artificial belts of trapped particles which in turn can be studied to determine the stability of such parties. Still further, plumes in accordance with the present invention can be formed to simulate and/or perform the same functions as performed by the detonation of a “heave” type nuclear device without actually having to detonate such a device. Thus it can be seen that the ramifications are numerous, far-reaching, and exceedingly varied in usefulness. Generation of ELF and VLF waves in the HF heating wave modulated polar electrojet is studied. Through the Ohmic heating by the amplitude‐modulated HF heating wave, the conductivity and thus the current of the electrojet is modulated to set up the ionospheric antenna current. However, it is shown that a stimulated thermal instability is also excited by the amplitude‐modulated HF heating wave. This instability introduces an electron temperature modulation more effectively than that by the passive Ohmic heating process and is expected to improve considerably the intrinsic efficiency of ELF and VLF wave generation by the amplitude‐modulated HF heating wave. Moreover, the generation efficiency and signal quality also depend on the HF wave modulation scheme. Thus, four amplitude‐modulation schemes are examined and compared. Received 7 October 1999; accepted 15 November 1999; . Citation: Kuo, S. P., M. C. Lee, P. Kossey, K. Groves, and J. Heckscher (2000), Stimulated thermal instability for ELF and VLF wave generation in the polar electrojet, Geophys. Res. Lett., 27(1), 85–88, doi:10.1029/1999GL003693. Personal Author(s) : Kossey,Paul A. ; Lewis,Edward A. Personal Author(s) : Kossey, Paul A. ; Lewis, Edward A.
Abstract : Ionospheric and ground reflection coefficients for transverse magnetic (TM) and transverse electric (TE) waves are given, at a frequency of 17 kHz and over a wide range of incidence angles. Both normal and severely disturbed ionospheric conditions are considered, and the relative attenuations of the TM and TE waves upon reflection from a soil of high electrical conductivity, and from ice, are given. A method of determining modal resonance angles from computations of ionospheric and ground reflection coefficients is described, and estimates of the relative attenuation rates of the TM and TE waves propagating in the earth-ionosphere waveguide are given. Energetic electrons trapped in the radiation belts undergo bounce motion about the geomagnetic equator. The behaviors of the trajectories of these electrons interacting with a large amplitude whistler wave are explored, with the electron energy and wave amplitude as variable parameters. A surface of section technique is used to examine the chaoticity of the system graphically. The wave amplitude required causing an electron trajectory to become chaotic decreases with increasing electron energy. Once the trajectory of an electron becomes chaotic, it can wander into the loss cone and subsequently precipitates into the ionosphere and/or the upper atmosphere. This chaotic scattering process requires a threshold field for the commencement of chaotic behavior in the electron trajectories. Therefore, a loss-cone negative mass instability process to amplify whistler waves by electrons in the bulk of the energy distribution is also studied. The numerical results show that the injected whistler waves can be amplified by more than 20 dB, agreeing with the experimental results. This amplification process reduces considerably the required field intensity of injected whistler wave for the purpose of precipitating those tail electrons in the megaelectronvolt range. A chamber experiment is conducted to study the propagation of high‐power microwave pulses through the air. Two mechanisms responsible for two different degrees of tail erosion have been identified experimentally. The optimum pulse amplitude for maximum energy transfer through the air has also been determined. It is shown that upper hybrid waves generated by the HF heater wave in the Tromso’ heating experiments can excite oscillating two stream instability near the upper hybrid resonance layer of the heater wave. The sidebands of the investigated parametric instability are obliquely propagating Langmuir waves. Battling rumours of death beams and mind control, an ionosphere research facility in Alaska finally brings science to the fore. Sharon Weinberger reports. It’s a Strangelovian scenario that only the Pentagon could dream up: North Korea, in the throes of a military coup, launches a nuclear weapon that explodes 120 kilometres above the Earth. The blast fills the atmosphere with ‘killer’ electrons that would within days knock out the electronics of all satellites in low-Earth orbit. It would cause hundreds of billions of dollars of damage, and affect military, civilian and commercial space assets. Ionosphere-Boiler Not a Superweapon, After All? Few military projects whip the tinfoil-hat crowd into a more fevered frenzy than the High Frequency Active Auroral Research Program. The massive array of electronics up in Alaska presumed to be an ionosphere- boiling superweapon. Or a weather controller. We review experiments in ionospheric modification and long distance propagation performed at the HAARP facility. Most experiments were in bistatic configuration with the WAVES receiver on the NASA/WIND satellite. Initial experiments showed scintillation-like variations in low frequency propagation through the earth’s ionosphere. A HAARP-HIPAS transmission experiment set up a spatial interference pattern measured at WIND. The Kodiak SuperDARN radar scanned the modified region above HAARP and observed the growth of ionospheric irregularities. Recently, lunar echoes at 8 MHz were detected by WIND. 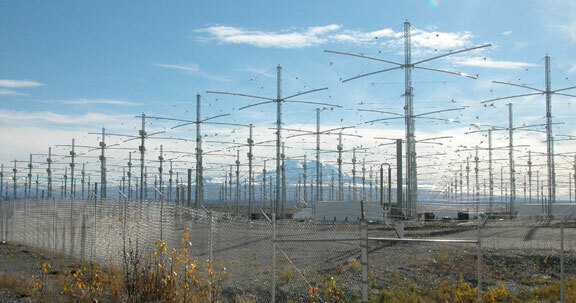 The experiments at HAARP will extend to nonlinear regimes as power levels increase. At high frequency, radio waves will interact with space plasmas and surfaces of local astronomical objects, producing an echo that can provide new diagnostic data. The availability of high power radars operating at high frequencies opens a window for the remote investigation of our surrounding space environment. We discuss and illustrate this technique with some specific examples. The High Frequency Active Auroral Research Program has constructed a new interactive ionospheric research facility in Gakona, Alaska. We present a description of the major components of the facility including technical detail of its current and planned performance capabilities and recent measurements of its operating characteristics. The facility has been used during numerous research campaigns since reaching its current level of performance in 1998. We present some initial results from these research activities in the areas of ELF/VLF generation, artificial optical emissions, and trans-ionospheric measurements. A team of scientists from the Naval Research Laboratory, the Air Force Research Laboratory’s (AFRL’s) Research Vehicles Directorate, Kirtland Air Force Base, N.M., and the University of New Mexico (UNM) has detected the lowest frequency radar echo from the moon ever seen with earth-based receivers. In the lunar echo experiment (more properly called a lunar bistatic radar experiment), the Air Force/Navy High Frequency Active Auroral Research Program (HAARP) high power transmitter, located near Gakona, Alaska, launched high power radio waves toward the moon. The reflected signal, weakened because of the long distance to the moon and back, was detected by receiving antennas in New Mexico.